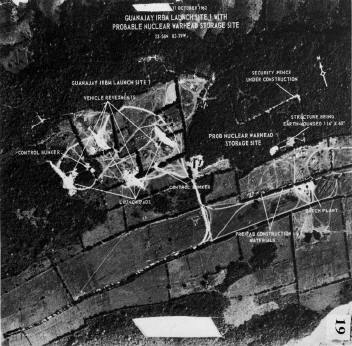 From the Jedburgh D-Day teams of the OSS, we see the beginnings of the CIA and the British efforts to penetrate the Iron Curtain. With the advantage of history, we'll look at what people whose names we would learn about later were doing before we found out they were spies! Plus, we'll give a survey of the best 'spy fiction' in each section. The fears were palpable: missiles could now reach anywhere on earth, in minutes. 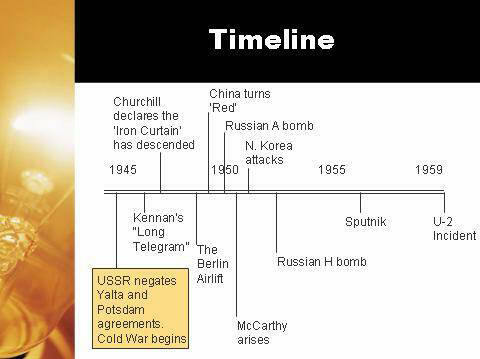 With nuclear warheads that didn't matter if they missed their targets by a mile, the fear of communism, painted as a conflict between good and evil, affected everyone in the U.S. In fact, the charge that the Republicans had allowed a 'missile gap' was seen as presidential candidate John Kennedy's strongest charge. We'll also examine the start of a trend that dominates the next 20 years with James Bond at Casino Royale. But along with Ian Fleming, we'll also talk about Graham Greene, Mickey Spillane and others. 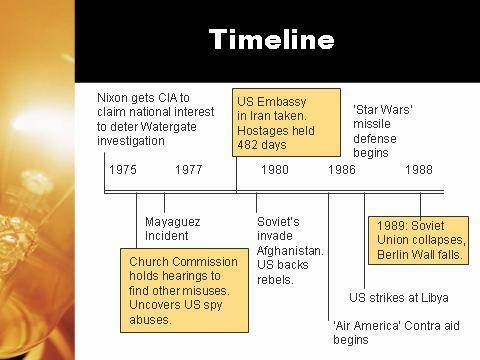 Part 2: Spies: The Boom (1960-1974) View the PowerPoint Presentation! At the dawn of the Sixties, spies became a box office bonanza. British spies dominated movies and books, and drove Westerns and private eyes from the TV screens and the paperback racks. But what was happening in real life? The British Profumo scandal brought down a government. East and West Berlin are divided by a wall, and 'Checkpoint Charlie' enters the dictionary. On this side of the Atlantic, before U-2 was a rock band, it was a plane and an incident. 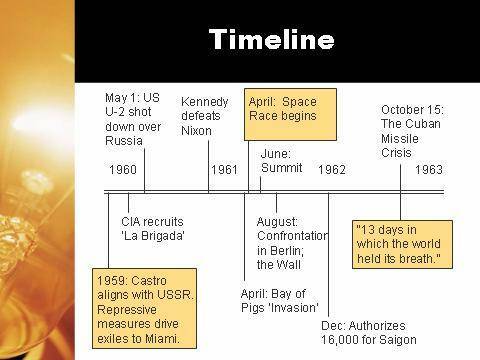 It later became important for information on the Cuban missile build up, and the resulting effort by the CIA to assassinate Castro. In fiction, we'll talk about Leon Uris, John Le Carre, Alistair MacLean, Len Deighton and Donald Hamilton. Actual U2 spy photos of Russian missile sites in Cuba. These pictures set off the "13 days in which the world held its breath." 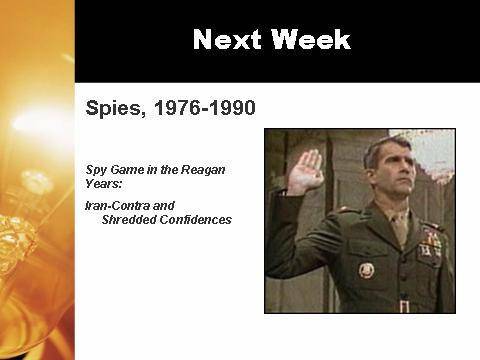 We'll look into the Church Hearings to show us what the American government was doing in the real world of spies. While the hip action of the screens cooled, some of the best spy fiction arises from this period as the snap back of reality enters their work. John Le Carre and Len Deighton dominate, but Frederick Forsyth also enters the fray. But what does a spy do when the Wall, and the Cold War, comes to an end? As the world adjusts to the end of the Cold War, the vaults open and secrets emerge. But are spies now a thing of the past? By the end of this period, former head of the KGB Vladimir Putin assumes command in Russia, a spy attempts to assassinate a Ukrainian politician with an exotic poison, and spy fiction seems to be a casualty - but is it? 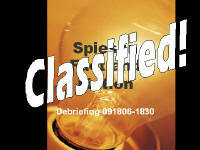 We examine the rise of the techno-spy, with Tom Clancy and the role of spies in the Hot Wars of 1990-2005. Also - where is spy fiction heading today?